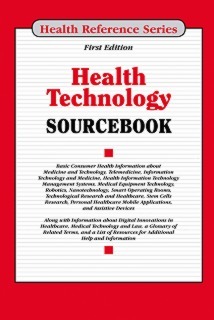 Health Technology Sourcebook, First Edition provides information about the application of science to develop solutions to health problems or issues such as the prevention or delay of onset of diseases or the promotion and monitoring of good health. Examples of medical technology include medical and surgical procedures (angioplasty, joint replacements, organ transplants), diagnostic tests (laboratory tests, biopsies, imaging), drugs (biologic agents, pharmaceuticals, vaccines), medical devices (implantable defibrillators, stents), prosthetics (artificial body parts), and new support systems (electronic medical records, e-prescribing, and telemedicine). The book concludes with a glossary of related terms and a directory of organizations that provide information about health technology. Part I: Medicine and Technology gives an overview about telehealth, types of telemedicine technology, remote monitoring, and imaging services. Electrocardiogram, computed tomography, magnetic resonance imaging, and other imaging services are explained. It also details the effects and effectiveness of telemedicine, and the past, present, and future of science and technology for disease control. Part II: Information Technology and Medicine discusses health information technologies and its applications. Electronic health record, e-prescribing, personal health records, electronic dental records, and secure messaging technologies are explained. It also deals with the concepts of health information management systems. Part III: Medical Equipment Technology deals with medical equipment such as robotics, wireless patient vital signs monitoring devices, and computer-assisted surgical systems. Additionally, it discusses about the future of artificial limbs, mobile stroke units, and light therapy and brain function. Part IV: Technology Research and Healthcare provides research information on nanotechnology, stem cells, artificial brains, and DNA microchip technology. It also describes artificial intelligence, 3D printed biological materials, and tooth regeneration concepts. Part V: Digital Innovations in Healthcare discusses various innovations related to sensors and wearable technologies in healthcare, personal healthcare mobile applications, and assistive devices. In addition, it also describes the SPHERE, a sensory platform for healthcare needs in a residential environment. Part VI: Medical Technology and the Law deals with medical records privacy, confidentiality, and health information privacy law and policy. It also discusses cloning and law. Part VII: Additional Help and Information provides a glossary of important terms related to health technologies and a directory of organizations that offer information related health technologies. "This volume in the comprehensive Health Reference Series provides up-to-date information about a range of healthcare technology related to such topics as preventative, diagnostic, and assistive treatments and research. The reference is designed to inform general readers, patients, nonprofessional caregivers, family members, and others about complex and rapidly advancing technologies in a clear and concise way… This first edition reference tackles a complex aspect of healthcare, providing current information in a straightforward way."